Starting Friday, BlackBerry users will no longer find their AIM client working on their smartphone. 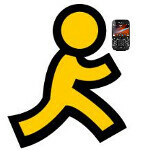 Instead, AOL is building a new AIM app for 'Berry users. Considering that the replacement is put together by AOL, it will have some more useful features, as RIM has stated in an announcement. The new client will allow you to stay connected to your AIM buddies and Facebook Chat pals while mobile, allow you to share your location when posting your status, upload a picture taken from the phone's camera or upload a saved snapshot, comment, like and update your Facebook, Twitter, foursquare and MySpace status from AIM, and get your updates from those same social networks. It is important that if you use the AIM application and want to continue to use it without interruption, you need to install the AOL built software and remove the old software developed by RIM by Friday. To remove the old RIM-built AIM client, you need to go to the sourcelink and follow the instructions at the bottom of he page. Once the old client is deleted, you can install the AOL built software by heading over to BlackBerry AppWorld and look for the app named "AIM" by AOL. The new AIM client will work for those with a BlackBerry device running OS 4.5 or higher.